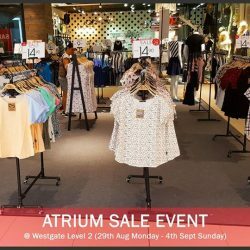 We are having an Atrium SALE event at Westgate Level 2 and also at our store #B1-08! Further Markdowns and big discounts not to be missed! Only 1 week 29th August to 4th Sept. Hurry head down now while stocks last! New Arrivals of family Matching sets available too. See You there! 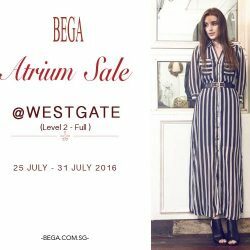 BEGA Atrium Sale at Westgate is back! Enjoy up to 70% off our apparels, accessories and bags! "New Concept of Korean BBQ meeting Steamboat!!!!!" 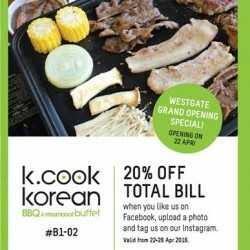 Westgate Outlet in Jurong east of K.COOK is opening on 22nd April. Please see the photo below for the detail. Enjoy Westgate dress for the celebrations with a fresh head of stylish tresses. Enjoy 30% OFF hair services with a min. 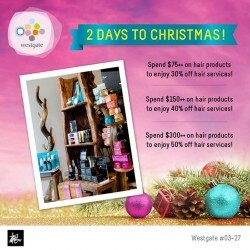 spend of $75, 40% OFF hair products with a min. spend of $150 and 50% OFF smooth and shine services with a min. spend of $300 at Gen (#03-27). If happy feet are what you want, you’ve come to the right place. Enjoy 10% Discount Storewide with additional discounts on multi-purchases at GEOX (#01-35). Take 50% off tops, bags and jewellery for their Black Friday sale happening from 26 Nov to 2 Dec 2015! Visit New Look at 02-44. Terms and conditions apply. 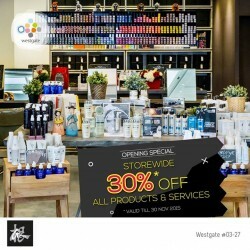 Gen (#03-27) has just opened its first shop in Westgate and there will be a storewide 30% off all products and services! Don't say bojio! 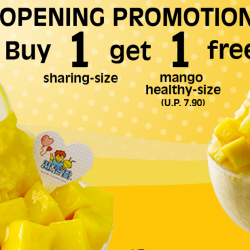 Valid till 30 Nov 2015. Do check in-stores for more details. 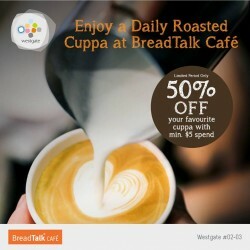 Westgate: Daily Roasted Cuppa–BreadTalk Café @ 50% OFF with Min. $5 Spend. 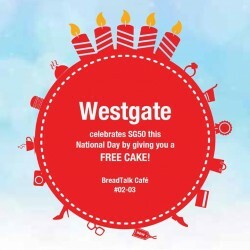 Westgate would like you to say no to half-priced coffee at Bread Talk Cafe offers their Daily Roasted Cuppa and save up to 50% OFF ☕  Do check in-store for more details. 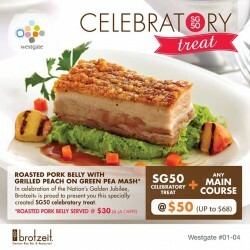 Till 1 Nov 2015 Westgate: DineOut Promotion–spot Of Asian Dining. Enjoy and simply enjoyment of food that reminds us of home. The fresh aroma of curry from Curry Times at Westgate (#02-08), that tantalizing sweet and sour chicken from Nara Thai At Westgate Mall (#03-07) and buffet spread of all our favourite food at ROBATA ROBATA (#03-10/11), Westgate is a hot spot for Asian dining. 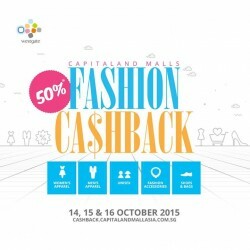 Till 14,15,16 Oct 2015 Westgate: Fashion Cash back @50% OFF. 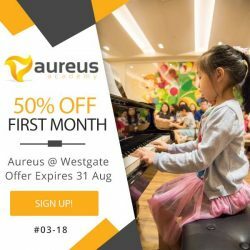 Westgate fashion cash is back starts this week. Get $30 Capita Vouchers when you spend a min. of $60 in a single receipt at any of over 520 participating fashion stores. We've just revealed ALL our participating stores, check them out and get ready to snag your favourite items during this 3 days only deal. Visit here now. Terms and conditions apply. While stocks last. Trick or treat! 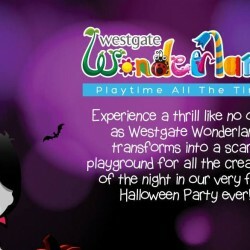 Halloween will be happening this October and this time, Westgate Wonderland will be hosting its first Halloween Party for the young ones! Come on down with your little ones to experience a night of fun with spooktacular highlights such as facepainting, candy giveaways, games and more! Choose from 4 different session dates to enjoy the Halloween thrill! 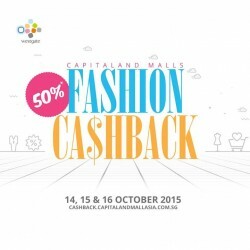 From 14-16 Oct, get $30 Capita Vouchers when you spend a min. of $60 in a single receipt at participating fashion stores. Register your interest at here and get an additional 1,000 STAR$® on your first transaction. #fashioncashback. Terms and conditions apply. While stocks last. Ready your wallets for the biggest TOKYU HANDS Singapore sale of the year! 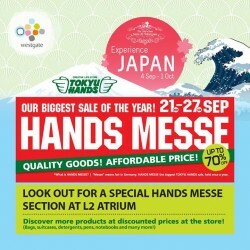 From 21-27 September, swing by #01-36/37 and L2 Atrium to splurge on quality and affordable Japanese goods. With discounts up to 70% off, Ganbatte! Make your tummy full at Westgate offers. 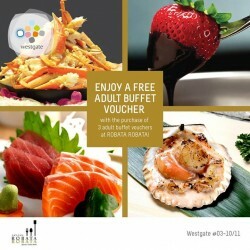 Calling all buffet buffs, here's a chance for you to eat all you can at Robata Robata (#03-10/11) with your friends. Enjoy 4 pax buffet at the price of 3 and eat away! Enjoy and try this now Dorayaki for only $1. 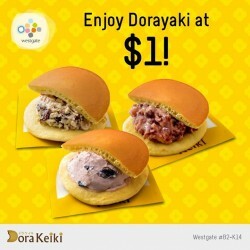 Dora Keiki (B2-K14) is having a special $1 only promotion for their Dorayaki cakes at their Westgate outlet! While stocks last. Terms and conditions apply. 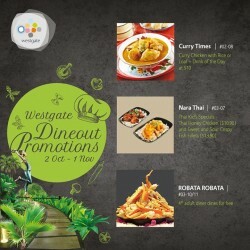 Promotion for their Dorayaki cakes at their Westgate outlet. Hey there Mom's make your children days fun at Westgate Kids Club. At Westgate, get to walk home with handmade race car clothes pins, steering wheels, racing trophies — and the victory of feeling like a FormulaOne champion. Other terms and conditions apply. 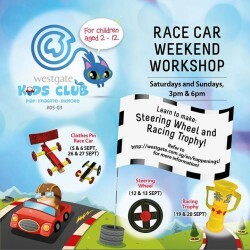 For more details, please contact us at 6908 3736 or visit Westgate Kids Club (#05-03). Check out here for more information. Enjoy and spend a min. of $50 at any two West Cluster malls (IMM, JCube or Westgate) and be the first 50 to redeem a free cake from us on 9 August 2015! Come and hurry! 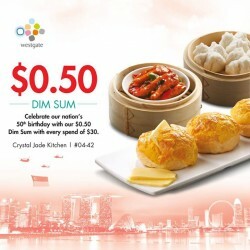 From now until 30th September 2015, pay only 50 cents for the following Dim Sum dishes from Crystal Jade Kitchen at Westgate (#04-41) with every $30 spent! Look fashionable without burning a hole in your pocket. Enjoy 50% off dresses, bags and shoes for a limited time only! Terms and conditions apply. Please check in-store for more details. Looking to rocket your kids into the fascinating world of outer space? 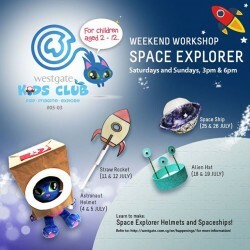 Take them to the Westgate Kids Club, where they can learn how to make space explorer helmets and spaceships, and well be on their way to becoming an astronaut or the next aerospace engineer! Hurry!